Below you will find 16 Sensory Christmas ideas for sensory loving kiddies this Christmas. Set up: place fun sensory toys inside the stocking. Include enough for one per person. Gather children to sit in a circle. The rhyme: (to tune of what can we do with a drunken sailor) What do we have inside the stocking? What do we have inside the stocking? What do we have inside the stocking? What can “__name__” find? Second rhyme: (same drunken sailor tune) “__name__” has found a “__toy/ball/light/drum__” in the stocking (repeat x3) that’s what “_name_” has found. The child then sits and the game repeats until every child has had a turn. You could place funny sunglasses, wigs or feather boas inside to add more fun. I like to play Christmas music to help them dance in the circle. Listening: children are listening for their name. Communication: children are choosing. Children are singing the rhyme. Children are saying what they’ve found inside. Number: children are choosing one. Shape: you could wrap the toys and children can guess what it could be before opening and continuing to play. psed: children are joining a group activity and waiting their turn. Creative: children can dance and play freely and confidently in the circle. Children enjoy the rhyme. PE: children are exercising their fine motor and gross motor skills. They explore their coordination. 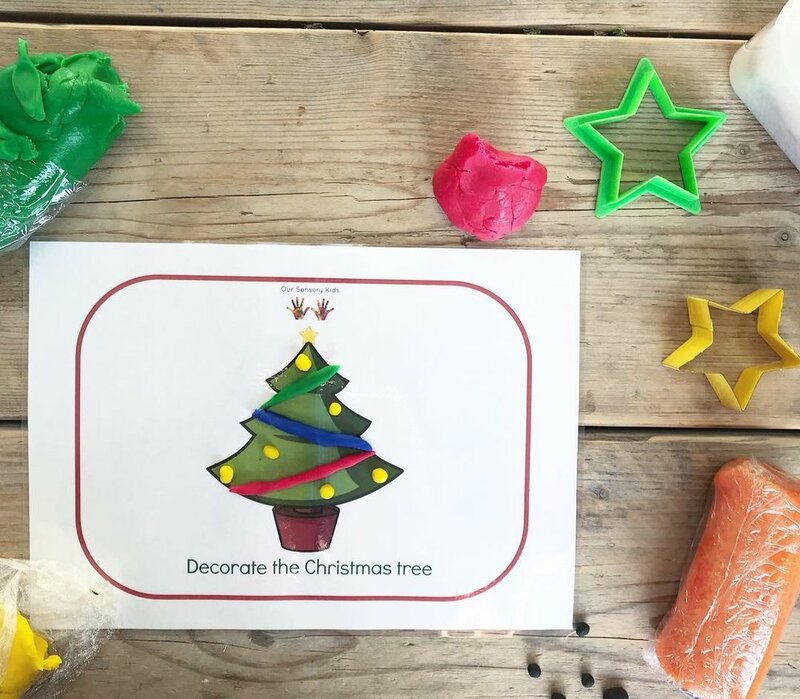 I created this sensory invitation to decorate the tree by covering a plastic bottle in foil and using food colouring to dye shaving foam green. I left Pom Poms and button’s out and let the fun decorating commence! 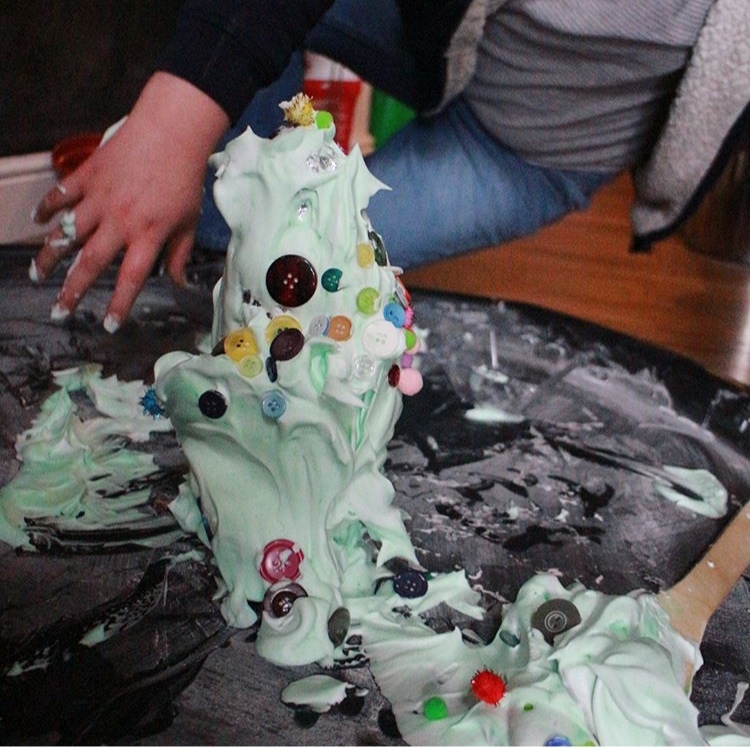 You could even use green icing and sprinkles if your littles still mouth as they explore. A really fun tree decorating activity that you can’t get wrong! Going to stay with Family with the little ones and are worried about boredom? Don’t worry we’ve got you covered! This is our £1.99 Christmas download pack. Perfectly light and easy to pack and wip out when needed! Literacy: Enjoy a three part story sequence. “Introduction, open, climax, close, finish”. Number: Use numerals “first, second, third.” Or song number action songs. Play ready, steady go! Games. Knowledge and Understanding: You could pop a simple experiment inside e.g mentos and cola volcano for a quick bit of science. Creative: role play how to play and use the objects for more than usual... then give the kiddies time to repeat, adapt and create their own games with the toys. PSED: pay attention to the lead adult for longer periods, wait for your turn, choose from a selection. I loved creating this guy to go on our diy lightbox. Wayyyy easier than you think too! I used red sand for his rosey cheeks which I think bring him to life. Black craft paper and coloured sand is all you need to create any design! I’m going to laminate the scenes for little hands can retell the story without fear of breaking the fragile pieces. I’d love it if you guys would give this a go! 1. DIY LIGHT BOX: pop Christmas lights inside a lidded container- the more the better. (I used three sets) each plugged in at the wall with the lid pushed over them and sealed. 2. I buy my craft paper and coloured sand from Baker Ross ltd.
3. Laminate the pieces on A4 sheets, already set out in the scenes you would like to use, so it’s not too fiddly for little hands. literacy: sequence the events in a story. Have a favourite story. Tell you’re own story. writing: fine motor skills to draw and cut out the pieces, and just handling the pieces is great practice. shape: focus on shapes you see and variety in size. What shapes can you use to make Santa’s face? science: explore light and shadow. PSED: work in a group or alongside others. Share an adult. Share ideas. creative: create your own picture using a variety of pieces available. PE: fine motor skills handling the small pieces. Mmmm Christmas pudding with felt holly and Pom Pom berries that is touch safe! HOW TO: make five balls of brown play dough. Place felt holly on top of each. You can make these with your kiddies. Rolling balls from play dough is a great fine motor exercise. Bought a Christmas pudding and took it away. Communication: practise exchanging a coin for an object. This supports understanding of exchange for Symbol (PECs) exchange for an object. Listening: action rhymes motivate and engage children. By only slightly adapting the words children already have an idea of what to do. Writing: rolling play dough ball is a great fine motor exercise to support writing. Number: exchange of coin is early money understanding. Depending on ability you could ask for a different amount each time. Also number rhymes and “take one away” is great early subtraction, you are also modelling counting down from 5. Shape: Handling and creating 3D objects to support understanding. PSED: wait for your turn. Independence skills for buying in a shop practise. Creative: create using play dough. Enjoy action rhymes and music. PE: fine motor exercise using dough. This puffy paint is so easy to make! Simply mix PVA glue with shaving foam and lightly spread onto your paper. It stays puffy even once it dries! Perfect for snowman crafts this Winter. Either way you can’t go wrong... I think it looks even cuter as a melted snowman! Gather tinsel, bells, metallic instruments and kitchenware and place on a foil emergency blanket. Add sensory lights or fairy lights for extra magic! Babies and sensory kiddies love lights! Rub a balloon on your head and experiment with static electricity picking up tinsel on different surfaces! Have a jumping competition over a line of tinsel. Can you jump over it? Can you limbo under it? Go on a barefoot tinsel trail. Can you balance along the tinsel line when it’s straight? What about a wobbly line? Explore tinsel inside a sensory tray or box. Pull it apart. Flap it. Watch it reflect flashing lights! Pop lots of tinsel on a parachute bounce it up and down. Watch it fly in the air. Sing Christmas songs. Squeeze lots of tinsel into a sensory bottle, so they can explore without the fear of mouthing. You could pop some bells inside too and they could roll it along the floor for tummy time. Use our ‘Sensory playdough recipe” to make your own scented dough or use pre-made stuff… both work well! Roll two balls, put in sticks for legs and antlers. Place two black buttons for eyes and a red one (or pom pom) for the nose. we’ve conducted a little experiment to make our own snow. 1. Bicarbonate Soda and Shaving foam makes a lovely soft snow to explore. 2. Icing sugar poured through a sieve looks like snow but tastes much better! You can draw into it on your tray. 3. Toy stuffing, lights and shimmery tinsel make mesmerising soft snow to lay on and enjoy in the dark. 4. Magic snow (available in our shop for 99p under “custom story sacks”) just add water and it makes very realistic feeling snow. 5. White waterbeads (also available in our shop under “custom story sacks” for £1.49 for two packs) makes fun bouncing snow balls. Just add water. 7. Talcum powder puffs out when squeezed, it makes a lovely white cloudy fog which falls like snow. Lovely and soft of your hands and smells fresh. We made all of the above and decided which we thought was best. Then inevitably they all got mixed together in an amazing gloopy sensory aftermath! Gather brushes and reindeer theme toys and stories inside a basket. Explore the brushes as you read the stories for sensory relaxation time. Simply pop a few bells in water or oil in a bottle and use a magnet to move the bells around. You could use it as a science activity to support children to begin to question and explore magnets. Communication- children ask a question. Number- how many bells can you catch? Knowledge and Understanding of the World- children are inquisitive and explore the world around them. PSED- children problem solve in a group. Children discuss an activity together. Creative- use the bottle as a musical instrument. Can you make your own instrument bottle? PE- fine motor skills to use the magnet to control the bells. Roll the bottle to one another along the floor. A wonderful teacher asked me for advice yesterday for Christmassy behaviour management ideas to get her class through to the Christmas break. These ideas anyone can use. Swipe through my stories later to watch video explanations too! To save your voice, if your kiddies are getting too loud or you need their attention to give instructions shake a tambourine or bells to gain this attention. It is a far nicer way than shouting! This is a hat you wear when you must not be disturbed. Either you’re working with another table group, or you’re filling in learning journeys or you just need a warm tea! It is a visual cue to your children that they need to sort themselves out for 5. Obviously you are still watching to see if they are okay, it just stops the unnecessary questions and tattle tailing! Rather than only noticing the negative behaviours, switch it up and praise for the good by giving them a Pom Pom or button to put in the class jar. Once full they get a treat! There are always children making good choices to find. This will tell the others what good behaviour looks like and will set a president. Hope this helps get you through the glitter and Christmas show chaos! See you on the other side! !